Today for Math Game Monday I am revisiting one of my favourites from when I taught Grade 3/4. My teaching partner at the time had used it in his Grade 5/6 class the year before, working to the hundredths of a second. Either way, the game can be played and loved by many age groups! It's called 10 Second Walk. Basically students have a starting line and walk up to the board and push the "stop button" (picture of a Stop sign) that is on the whiteboard. 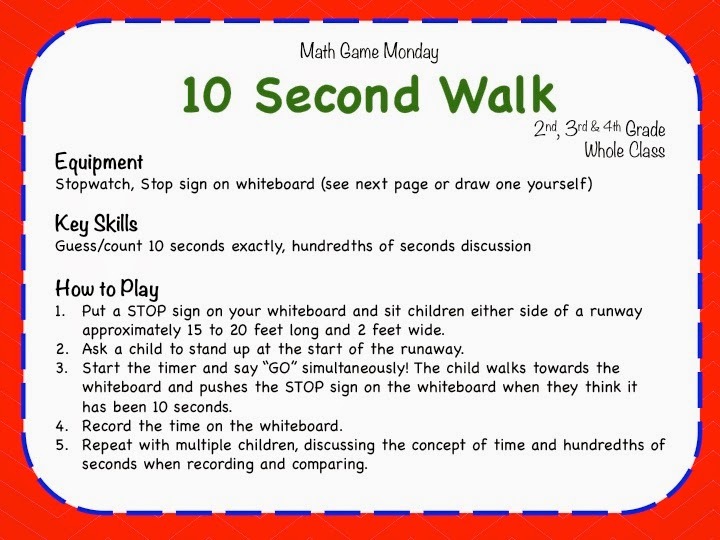 Record each student's time on the whiteboard, working through as much of the class as you want to! The winner is the student who is closest to 10 seconds. Here are the instructions to download.